Relieved that Lorkin is coming home, Sonea prepares to meet with the traitors on behalf of the Guild. Then bad news arrives: The Sachakan king has imprisoned her son. As the Sachakan king tries to force Lorkin into betraying the traitors, Dannyl questions his friendship with Ashaki Achati. Can he trust the Sachakan? Not at all, if Tayend is right. But do Tayend’s suspicions spring from good political instincts, or jealousy? Easily evading capture by the Guild, the Rogue knows only one obstacle lies between him and his ambition to rule the underworld: Cery. Forced into hiding, protected by Lilia, Cery must wait for the Guild to find his enemy. But is Black Magician Kallen purposefully failing in his task? And Lorkin must decide where his loyalties lie, for whatever choice he makes will require a great sacrifice. Trudi Canavan once again works her magic in the conclusion of this novel. the only downside i saw with it was everything that happens was to predictable. there was no surprise with her as you finish the trilogy. i love the whole world created but already we can tell there is another trilogy of another threat of magic yet to come. you know this in book two, yet there is no real hints of it found in this book, no regret no injury. everything just seemed to be book is done everything will be alright. no new challenges or adventures left to go on. this is my sixth book, on to 7, 8, & 9... I hope the magic continues. I Love this series! It's a great listen. Tridi C.is a great author. Loved it! I was very impressed by not only the storyline completion for the series, but the narrators excellent performance. There were some issues with his reading in the "Magicians Guild", but those have disappeared completely and the execution of voices and dramatics were spot-on. Well done! What did you love best about The Traitor Queen? it was an great book that fited really good in the series. i realy made mit smile quite offten and i liked how i could emphasies with the characters.the whole mother son relation between lokin and sonea is really fun to hear to! 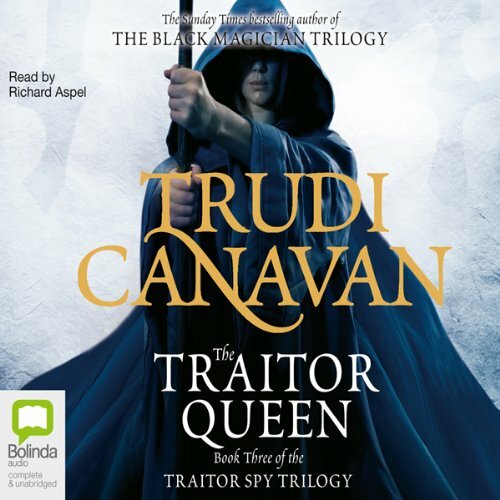 Trudi Canavan's, traitor spy series is a great series by author, but the narration leaves a listener wanting. His pauses are wrong, the story has no feelings to grasp. Very dissatisfied with this book. Great Trilogy, i liked all three books. However, you need to read the Black Magician Trilogy first to get alot of the background needed to understand/follow the back story. What did you like best about The Traitor Queen? What did you like least? It was a reasonable story and I enjoyed listening to the narrator. Did Richard Aspel do a good job differentiating all the characters? How? 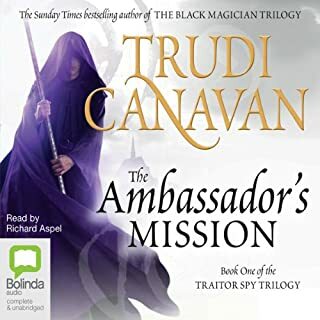 When Trudi Canavan started with the Spy Traitor Trilogy I thought she is might successfully introduce us to a male leading character in her female dominated world. It seemed that Lorkin, the son of the heroine of the Black Magician Trilogy, Sonea would take the centre stage in a topsy-turvy world. Alas it hasn't come to pass. 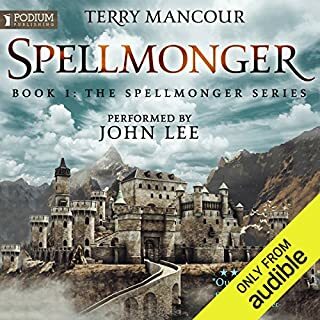 While taking the reader through memory lane with various references to situations in the Black Magician Trilogy, it felt that a lot of the male characters in the story just fell flat. I commented on her book "The Rogue" that I experienced a bit of a deja vu feeling after listening to it. Unfortunately "The Traitor Queen" confirmed it. My impression is that the Spy Traitor Trilogy recycled the basic ideas and concepts of the Black Magician Trilogy. That I find disappointing. 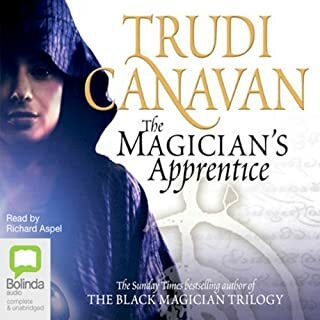 I also like to echo a previous comment about Richard Aspel, I think Samantha Bond that read the abridged version of the Black Magician Trilogy has a voice that can bring Canavan's fantasy universe better to life. What did I like about the book? At least Trudi Canavan was able to bring the story to a successful conclusion. She stuck to the basics, but it is time, I think, to go beyond the basics in the next book, which I hope will not be set within the same universe. In short, this is not JRR Tolkien or George RR Martin stuff, but it is still enjoyable, but beware that some of the characters becomes stocky and even a bit unbelievable. What made the experience of listening to The Traitor Queen the most enjoyable? Sonea, the main character was my favourite as you'd expect, her sense of right, self doubt and belief in the Guild made her stand out above the rest. Despite her punishment for practicing black magic she held no malice towards the Guild and doesn't realise the respect she has from other magicians. Have you listened to any of Richard Aspel’s other performances? How does this one compare? Richard is the narrator for all six books in the two series and is very easy to listen too. It's surprising to have a man doing the voices for the main female character but he is so convincing and the voices he gives to each character add to their authenticity. 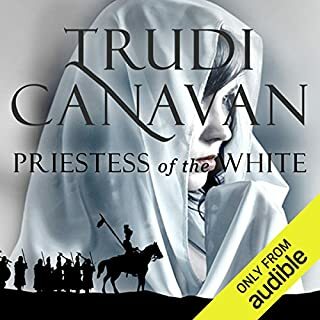 I have listened to many books, usually whilst travelling and not many have made me want to set off as soon as possible and put the audio book on..... I've even avoided taking phone calls whilst listening to the book. What do I do now I have finished these books and there are no more with the same characters, I feel that they have become friends and I won't be seeing them again. I hope the author continues the series with the younger magicians that have been introduced. This could have been so much better. Trudi Canavan is not a brilliant writer but she's not that bad either. This book was filled with missed opportunity. Many of the themes have been lifted from previous characters, and some of the story lines are incomplete. The ending was satisfactory but could have been better. Would I recommend this to others? Yes. But if you are looking for a thrilling ride you won't get it from this book. What was one of the most memorable moments of The Traitor Queen? Yes he was brilliant. Just a few moments when his performances changes. The book was far to long to listen in one sitting. I read this book at every spare moment. Fantastic end to the Trilogy!! 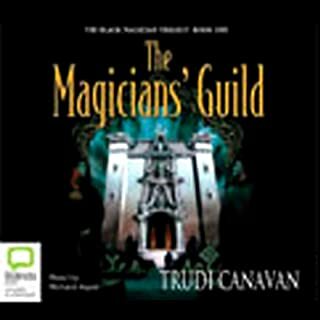 If you have not experienced trudi canavan before I would start with the Magician's Guild first as it it's the trilogy before this one. A combination of great plot twists, interesting characters and a beautifully sculpted magical world once you start listening you will not want to turn it off! Trudi Canavan ties up all plot lines nicely in the final instalment, with a nice moral and optimistic conclusion. I also managed to finally get over the narrator pronouncing nearly all the characters‘ names completely opposite to how I’d imagined them in my head (after listening to all 6 novels in the 2 trilogies!) and conclude that his style was pretty good in the end, well-paced and with decent inflexions, as well as a reasonable attempt to make the main characters sound different. Definitely worth a listen. This is a great final instalment in the series. 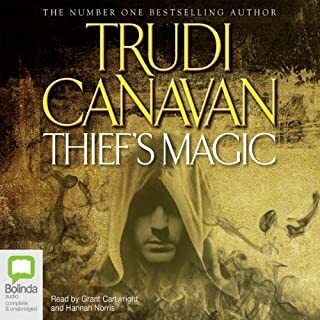 I would recommend any of Trudi Cannavan's books. Loved this book, finished off the trilogy nicely. Must admit I didn’t want it to end and would love to see another book featuring these characters in the future. 3rd book better than the previous 2. Final book was the book I expected... The previous two though building up the world and story felt lacking. Glad I persisted with it but wish the previous two were better. excellent ending to a great story. Richard is as good as ever and I hope there will be another trilogy continuing this one.